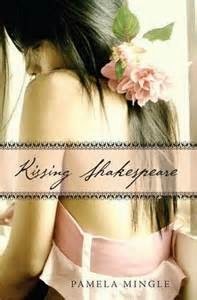 If you enjoy romantic time travel, written for the YA reader, you may well enjoy Kissing Shakespeare, by Pamela Mingle (Delacorte, 2012) . If, perhaps, you ask for a tad more than time travel back into a love triangle of sorts, such as political/religious tangles of plot, you will get that tad more. But if you ask for a lot more...not so much. Miranda is a young actress, very much conflicted about the whole acting thing because she is the daughter of famous Shakespearian actors. Stephan is a young Elizabethan gentleman, with the ability to travel through time, who has arrived in the present, started watching tv to gain an appreciation of cultural norms, and insinuated himself into the play that Mrianda's currently starring in (The Taming of the Shrew). Stephan is pretty sure (based on the shows he's watched) that modern teens throw themselves into bed with each other with delighted abandon, and he's reasonably sure that Miranda won't mind travelling back into the past with him so that she can seduce Shakespeare. She does, rather a lot, especially because (with excellent reason) she is furious that Stephan considers her a wanton wench. (Teenaged Shakespeare is in danger of become a Jesuit, which is convincingly possible as things are presented here. Being seduced, Stephan assumes, will make him less likely to leave the world and it's pleasures behind....and the world won't lose his plays, which would, Stephan's visions inform him, be catastrophic). So there's Miranda, back in the past acting the role of Stephan's sister, and rather conflicted about losing her virginity to Shakespeare (assuming the seduction works). And there are a bunch of secondary characters, very much concerned with religion (because many of them are staunch Catholics, which was not as safe as may be under Elizabeth I). And there are Stephan and Miranda, kissing...and Shakespeare and Miranda, kissing....and Miranda wanting Stephan to kiss her more... (while still Stephan wants Miranda to jump into bed with Shakespeare, which was icky). Like I said, you have to enjoy romantic time travel to really like this one, and it wasn't quite enough for me, especially since the romance was tinged with ick. On top of that, my reading experience was rather spoiled by a historical error-- in 1581 you can't pass off a befuddled girl as a servant recently come from the New World. And so, perforce, I distrusted the historical accuracy of the book from that point on, and though, apart from a reference to leprosy being a thing of the past in England (which, Wikipedia informs me, it wasn't until two centuries later) I didn't find any thing else that seemed wrong, I never shook off my suspicions. I was not soothed by Miranda either--although apparently she did a just marvelous job passing herself off as an Elizabethan, I wasn't convinced. I was glad when the religious element of the plot (Catholics vs Protestants) pushed itself to the forefront of the story about halfway through -- it made a rather slow-moving story more interesting. And there was the added thought-provoking thread of the role of women in Elizabethan England. On the down side, Shakespeare himself barely added any interest--I can't remember him saying anything at all Shakespearean, which was a disappointment. In any event, read this if you want a bit of historically tangled romance, but not if you want a really satisfying time travel story. "This novel is definitely a cut above the typical teen romance. A delightful story about star-crossed, time-traveling lovers." "Mingle remains true to the history and events of the era, thus revealing the challenge of living in a time of religious persecution and suppression of women."